Since early November we’ve been asking bands about their favorite foods and recipes, the stuff they eat at rehearsal or order from restaurants on the road; we’ve asked about favorite foods that folks associate with their music or good times in general. We’ve mentioned we want to compile a book featuring recipes and the independent music bands that love them, and there’s been some questions about WTF we’re talking about. To help share our vision we put together a rough page with the elements we’re looking for as an example. 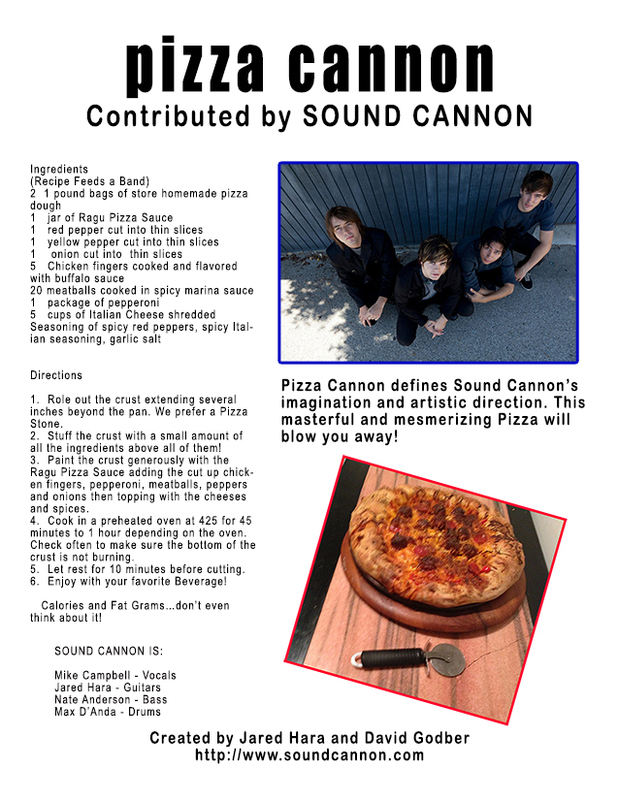 This recipe comes from one of the hardest working bands we know of, SOUND CANNON, who will be performing at our Holiday Music Festival and Toy Drive next week. Take a look and although it’ll be put together much more artistically for the actual book, you’ll get an idea of what we’re looking for. If you have a favorite food but don’t have a recipe, we can help find one that fits! We can also make the recipe ourselves and snap a pic. All we need are bands and artists who are willing to get noticed! If the pic below is too small to read, you can download a full-page jpeg here. Send your food ideas and recipes to ShockBoxTV@gmail.com and include a hi-res photo of the band as well as the name of the members and contact information. We’ll do the rest!! !